My second morning here. Another glorious day in Incredible India. 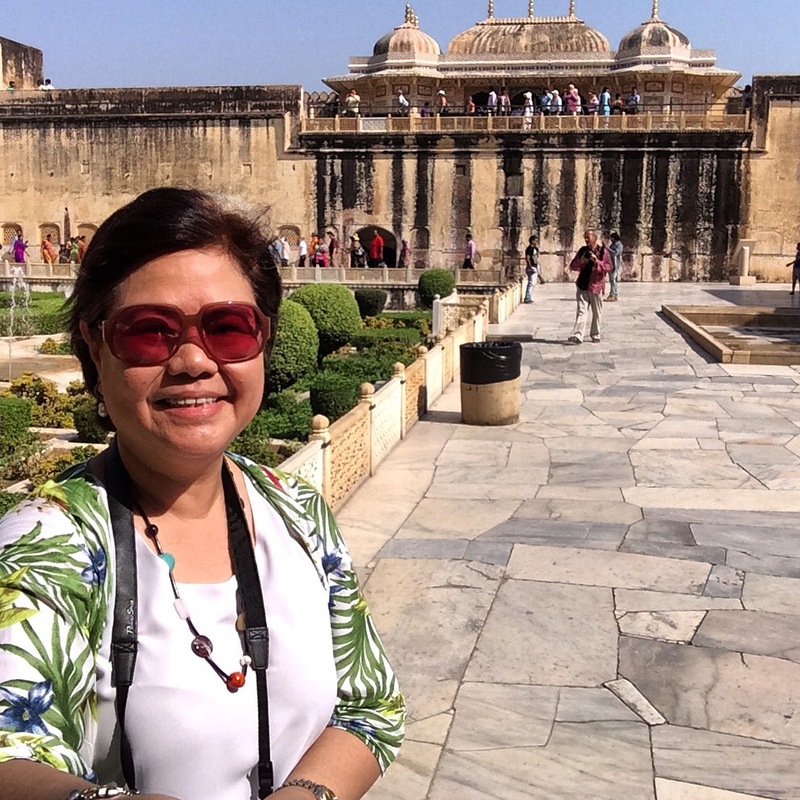 Perfectly timed while I turned 60+1 in this Pink City of Jaipur where Maharajas of the Mewar Dynasty once lived. You may ask: Maharaja (Sanskrit) or Maharana (Hindi)? Both mean “great king” or “high king”. In my book, either refer to royalty. The Mewar Dynasty is one of the oldest dynasties in the world, having produced 75 rulers from 600 AD to 1947. Quite a feat, especially with the many forts and palaces built during their reign. But what history lessons for the young Indians. I couldn’t even remember a few monarchs’ names, so I can imagine how nerve-wracking it is for Indian youth to review their history lessons. The Lake Palace. In JAIPUR. Lovely, isn’t it? 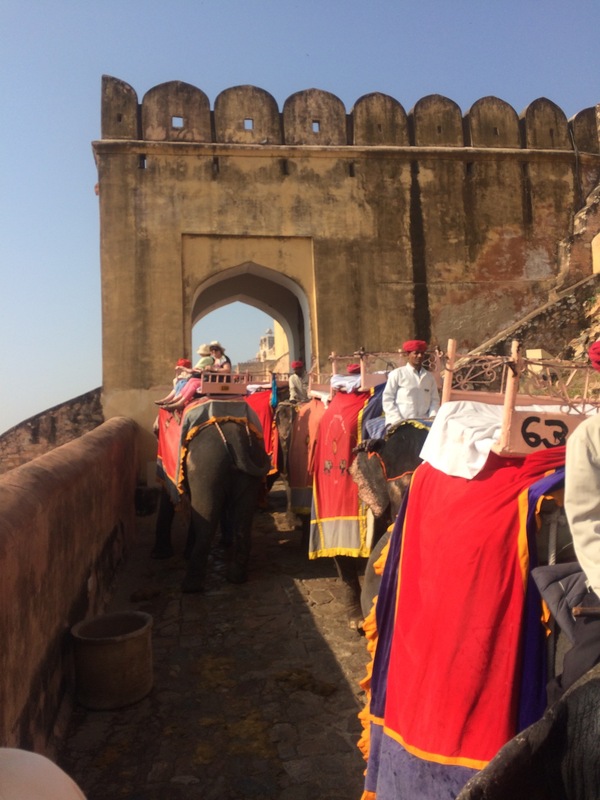 The highlight of today’s trip is the ride on caparisoned elephants up to Amber Fort in Jaipur —- reminiscent of the Royal lifestyle of the Maharajas of Rajasthan. Pink is the Rajput color of hospitality. Where I stand (rather, sit “rocking” on an elephant) now, I see Pink. Not really pink. It’s more like faded terracotta or my fav SALMON PINK hue splashed on Rajasthan’s lovely Jaipur with its many hill forts and series of palaces I could hardly commit their names to memory. Also called Amer Fort some 11 kilometers from the city of Jaipur. 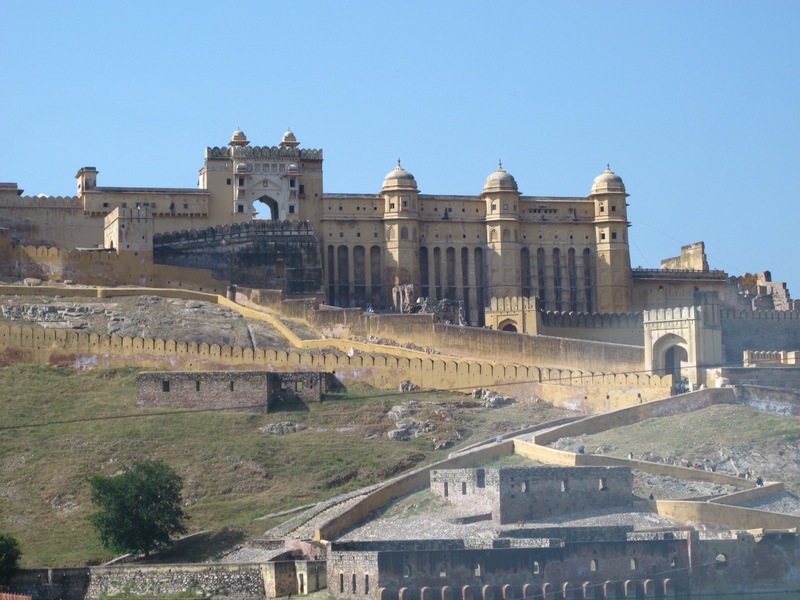 Its sheer location tells you this is a fortress palace with an encompassing view of the entire pink city. Built in 1592, the hues range from honey-colored to salmon pink to terracotta orange. Not exactly pink, but NEAR PINK. 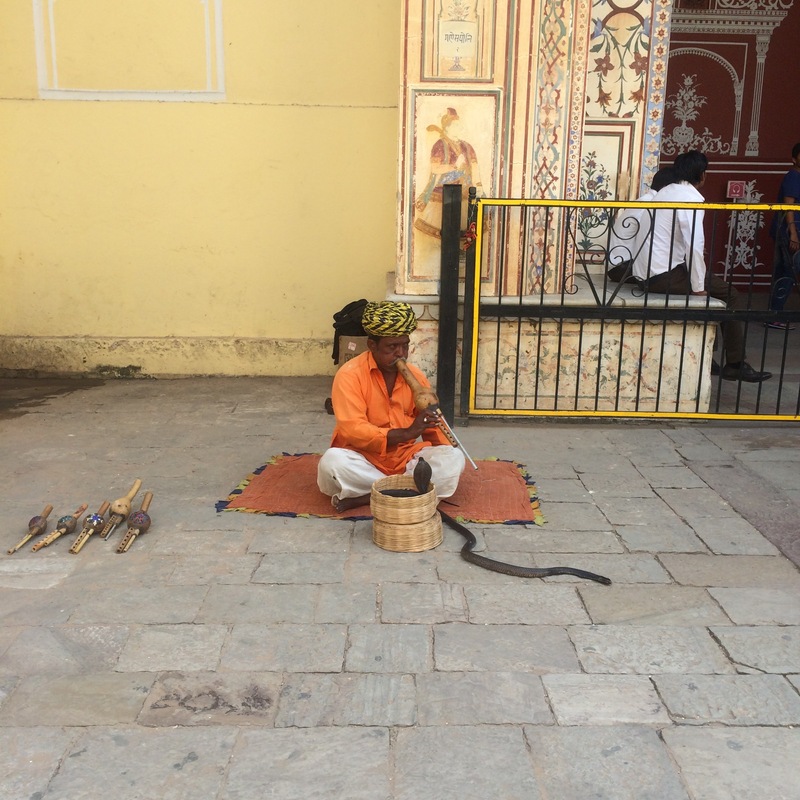 A snake charmer hides his prized pet when we tried to take photos. A dollar for a photo, please. But we managed to sneak a few. It’s a rocky ride as the elephant sways left and right, and sometimes sprinkles some water (?) on its back, reaching its unsuspecting passengers. The pink shade of the stone used exclusively in the walled city is a major attraction by itself. Same with the City Palace. Now throw in the beautiful filigree screens, the myriad honeycombed and latticed windows bathed in the special glow of the afternoon light, and you feel like walking into a period movie set. Bollywood, baby! I wonder what movies or TV series were filmed here. As soon as you get off, the interiors of the fortress palace compel you to wander around to view the city from all angles, and to check out the many pillars and latticed windows. Pink takes on a variety of shades here depending on the time of day. The colorfully clad Rajasthanis complement the big picture of this truly fascinating place. 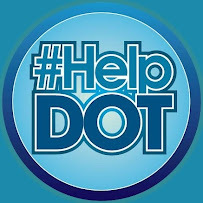 The only sore point is the unrelentless sun on this humid day. Lines were manageable, and a good time to sneak a few shots of the elephants queuing to climb up. 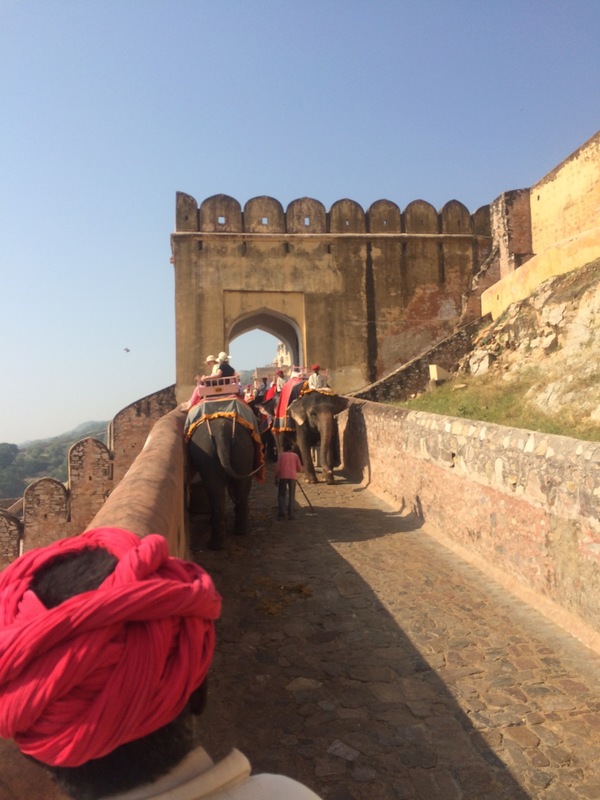 Another shot of the climb up the fortress palace on caparisoned elephants. Rajasthans, no. 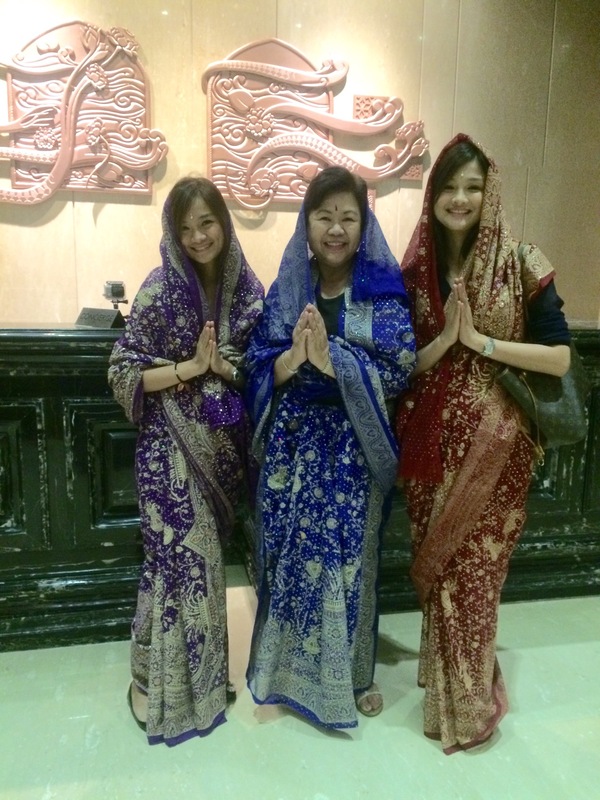 But I couldn’t resist posing with these sweet young things in our newly-purchased saree. Perfect for our Diwali Festival Night at the Diggi Palace. « How About 26 1/2 Hours On My Birthday?